There has been plenty of updates been brought to Guild Wars 2 in February, and the game was still continuously updated with more new contents, known as Flame & Frost event. Now let’s take a look at some of the contents came into the game in this month. 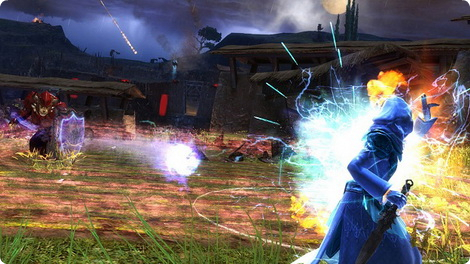 Guild missions in Guild Wars 2 are a sort of long-term discussed issue. While it hasn't yet been possible at present to unlock all the mission types. 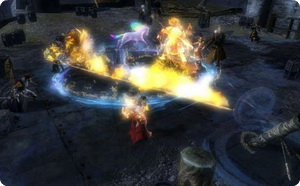 In this time’s update, Guild Wars 2 was introduced with five new guild mission types. 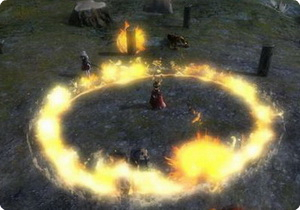 These new mission types are to support player versus enemy group-based combat, according to a post by content designer Leah Rivera on the Guild Wars 2's official website. The new guild mission types include Guild Trek, in which players scour the landscape to find locations, Guild Challenge, Guild Rush and Guild Puzzle. The missions could be unlocked by Guilds in the guild tech tree. Guilds will also be able to recruit other players in the missions because they take place in a persistent world. In January, ArenaNet announced plans to expand and balance the achievement system and add content that would encourage players to fight in groups. This is what they’ve done in the next month, the developer detailed updates that would tweak spawn points to foster teamwork. Therefore we can see that after the updating, it will be easier to be in a large guild rather than a small one, if you want to complete the mission more efficiently. Larger guides has more add-on. One of the most interesting parts of the recent changes in Guild Wars 2 was the change in reward structures. Big boss chests like those you'll find at the end of a fight with the Shatterer, the Claw of Jormag, or one of the Orrian Temple bosses are now guaranteed to reward at least one item of rare quality or higher. While the fights can be fun on their own, there was a real disparity between doing some of the legitimately coolest content in the open world game and walking away from it with a small handful of blues. Of course, especially with ectos being as in-demand as they always are, this has led to a lot more people than had typically been usual dancing attendance on the Frozen Maw, the Shadow Behemoth, and other meta events that were affected by the change. That, in turn, led to a truly appalling amount of lag during these fights. There are only so many short-term solutions to this. Naturally, we'd all be thrilled if the long-term solution were for the underlying issues that come about when you get all the players together in one tight space to get magicked away by some exceedingly clever and hard-working ArenaNet folks. A short-term solution seems to have been dropping the map population cap by a bit. Daily achievements have changed a bit, mainly with the PvE Daily's, as now you have a larger variety to choose from for specific PvE events, allowing you to do things like killing a Champion-grade monster, to gathering so many materials. Along with the Living Story portion is the addition of the Living Story achievement which when completed earns you rewards and titles, as a part of the current Flame & Frost event, you'll be helping refugees and fighting off conquering forces. With completing comes earning a new currency called Laurels which allow you to purchase items from specific Laurel vendors, from special infusions, armors, and other such items. You'll gain one laurel per completed daily achievement, and 10 laurels per one completed monthly achievement.